Air conditioning & heating systems always seem to break down when their needed most. Preventative maintenance will help avoid breakdowns and will extend the life of your heating and cooling systems by as much as +20 years. Failure to replace a $12 worn belt or dirty air filters can, and will, cost you thousands of extra dollars in damaged equipment. A planned maintenance program will also save you money by keeping your system running at peak efficiency. Your HVAC systems have design limits, and must be properly maintained. Every time one of our Master Service Technicians arrive at your facility you can rest assured that he has a minimum of 10 years experience in the industry. Our technician will be able to efficiently diagnose and repair any problems you might have the first time, for a very competitive price. Many of our competitors send technicians our to their customers that we would still have years to go in our apprentice program. And others send someone trained only to change Air Filters & Belts. We always send an actual Service Technician so any emerging issues can be caught early to save you money & ensure your comfort. By signing up for our planned Service Agreement you will always receive priority service in the event of an emergency. 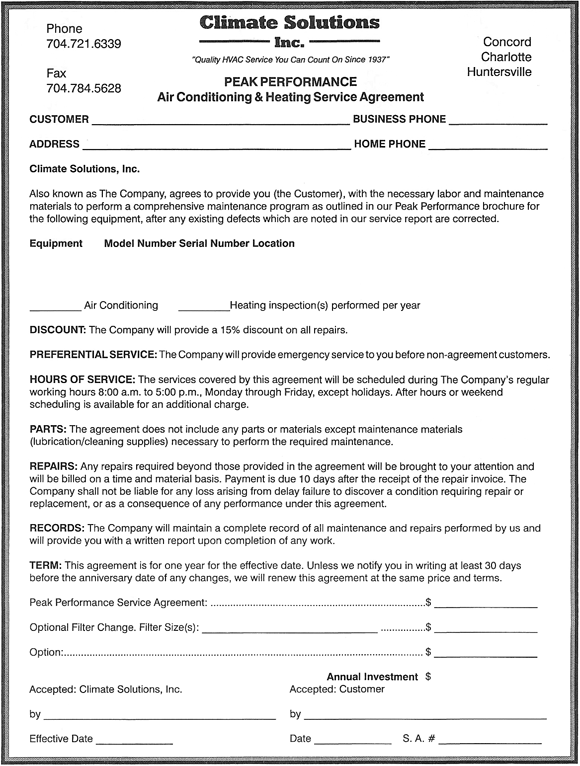 Our Service Agreement customers also receive an additional 10% off parts and labor for any repairs needed through out the year.